“The lack of affordable rental housing is a consequence of not only [increases in the number of] lower-income households but also steeply rising development costs,” Harvard University’s Joint Center for Housing Studies concluded in its annual report on the nation’s housing stock. A decline in available apartments renting for under $850 are depriving working-class families of options. “[O]nce-affordable units have become out of reach for lower-income households,” the report said. Rents have been rising since surging demand following the foreclosures in the mid-2000s forced homeowners into apartments. At the same time, higher-earning couples began to view renting as a less risky option. The decline in affordable options is pronounced in what are known as “naturally occurring” affordable units. 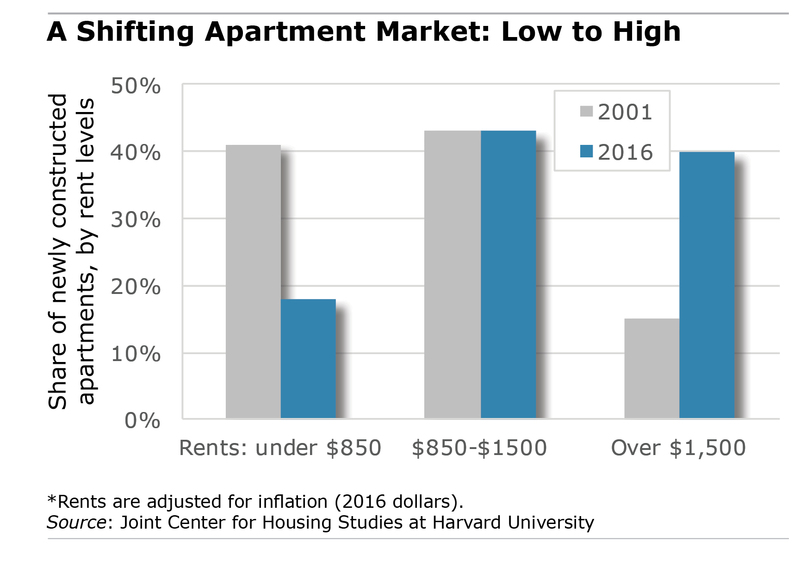 As apartments in older multifamily buildings become dated, their rents naturally stall or fall. But with so many people in need of housing, including the swell of working Millennials, rents in many of these units have moved out of reach for lower-income people. Like the rental market, the situation in the Boston metro housing purchase market is just as difficult in terms of affordable housing. According to the National Association of Realtors, prices of less-costly existing single-family homes in the region have risen by almost 7.5% in the last year alone, far outstripping income gains. Thin inventories of available homes to buy leave marginal borrowers at a disadvantage, as they lack the means to compete against stronger bidders and cash buyers. With older housing stock being renovated and whole neighborhoods being gentrified, the squeeze may worsen before it gets better.